Do you have casino tokens, chips, or silver strikes? Many of these tokens are valuable, as they have a core comprised of 60% silver with a brass, or copper ring around the outside. You may have brought some of these home from Las Vegas many years ago. After the U.S. Government stopped issuing silver dollars in 1964 Silver strikes, or tokens were used in slot machines in Las Vegas, and other gambling establishment’s slot machines. After it became apparent that customers were hoarding silver dollars, the Gaming commission allowed the substitution of gaming tokens in August of 1965. Many of these faux coins were minted by the Franklin mint and a few other mints. While no longer used today, there were many of these tokens carried home by gamblers as a memento of their visit. Since these casino tokens generally had a $10.00 value in the casino, they felt like they won if you took them home instead of cashing them in. Of course these were used in a time when silver was cheaper than today. Since there were over a 100 different chips issued, many casinos thought that customers would collect them and some did. Some chips were issued as limited editions. Once the price of silver went up, the tokens were no longer minted or used. I buy and sell silver Casino chips. 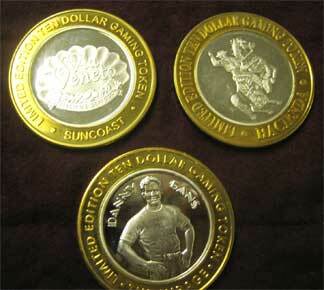 If you have tokens that appear to have a silver center, you can bring them in for a free appraisal.